I’m going to tell you a secret. When your friends have children and they can’t stop telling you how easy it is, and what a super duper joy babies are every day especially at 3:00 a.m., and how diapers aren’t really that big a deal, you should take their claims with a medium-sized grain of salt. Especially if those friends only know, like, a handful of people who have babies and most of them live outside the city which is too far to take public transportation for play-dates. They want you to have your own kids and join them. I am shameless about it. Babysitters are expensive, so it’s nice when you can convince a few people close by to procreate and trade free babysitting, or even just spend Saturday nights together, drinking red wine and sighing heavily over the cost of daycare. And it took a little while, but I got one! My friends Aimee and Evani are expecting their first miniature human burden! This is very exciting news, as they just moved ten minutes away and right across the street from the place that sells dosas for $5.99 on Mondays. We are going to do so much commiserating! I am going to eat all the curry pancakes! 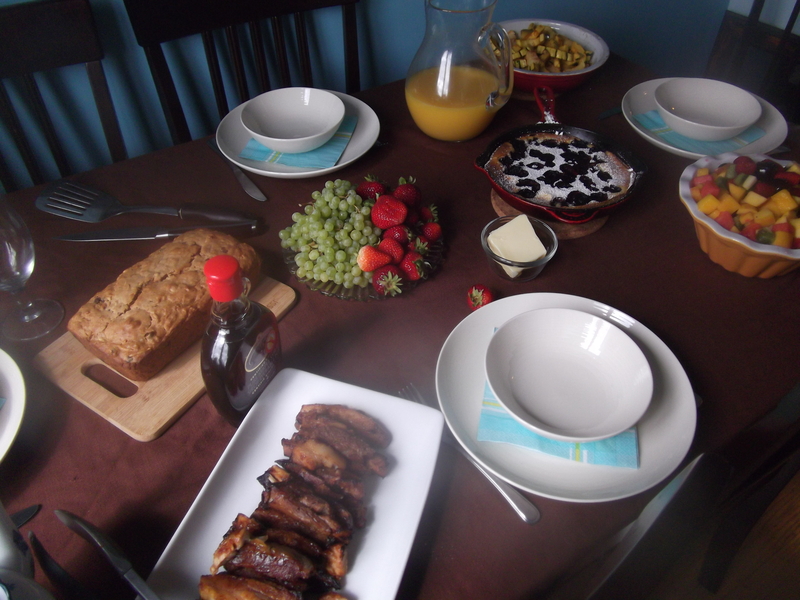 In the meantime, it’s important for a pregnant lady to have brunch made for her once in awhile. 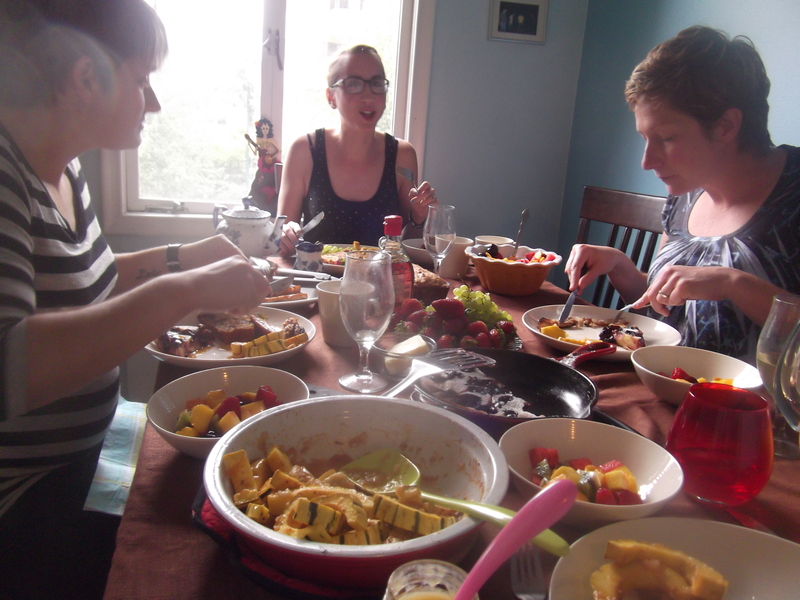 So this past weekend, Aimee, Evani, and Vanessa – three lovely, funny ladies – and I plonked down at my dining room table and we ate until we could barely muster the energy to stand up and waddle to the couches afterward. For Aimee, I candied some pork belly. And now we are never having mere bacon at brunch ever again. I stole the brining and braising of the pork belly from the Momofuku cookbook. You can find the recipe for the pork belly buns online, but I highly recommend this cookbook. Everything I’ve made from it has been worth making again and again. Whisk together four cups of water, 1/2 cup of brown sugar, and 1/2 cup of Kosher salt until mostly dissolved. Place in a large, sturdy zip-top bag or container with a lid, and pour the brine over top. Seal and let brine in the fridge for 24 hours. Remove pork belly from brine, and place fat side up in a 9″x13″ baking dish. Preheat oven to 300°F. Pour apple cider or juice over pork belly, cover the whole thing with aluminum foil, and cook for 2 1/2 hours. Remove from oven, cool completely, and stick back in the fridge for at least three hours but preferably overnight. Remove chilled pork belly from fridge. Cut in half width-wise (with the grain of the meat) and then into length-wise slices (across the grain of the meat) about 1/4-inch thick. 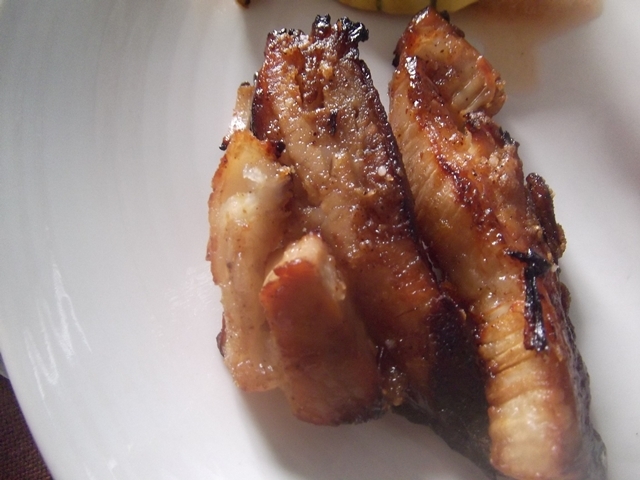 Line a rimmed baking sheet with parchment or foil, and lay slices of pork belly evenly across the pan. Mix remaining brown sugar and salt with smoked paprika, cinnamon, and cayenne pepper. Sprinkle half of the mixture over the pork belly slices. Turn on your oven’s broiler, and stick the pan right underneath. This part is going to require constant vigilance – it will take just a second to burn, so you need to pay attention. Watch the surface of the pork belly; what you want is for the sugar to melt and bubble. When it’s done that, take out the pan, flip your slices, and sprinkle the remaining sugar mixture over top; stick the pan back under the broiler and watch for the same sizzling. 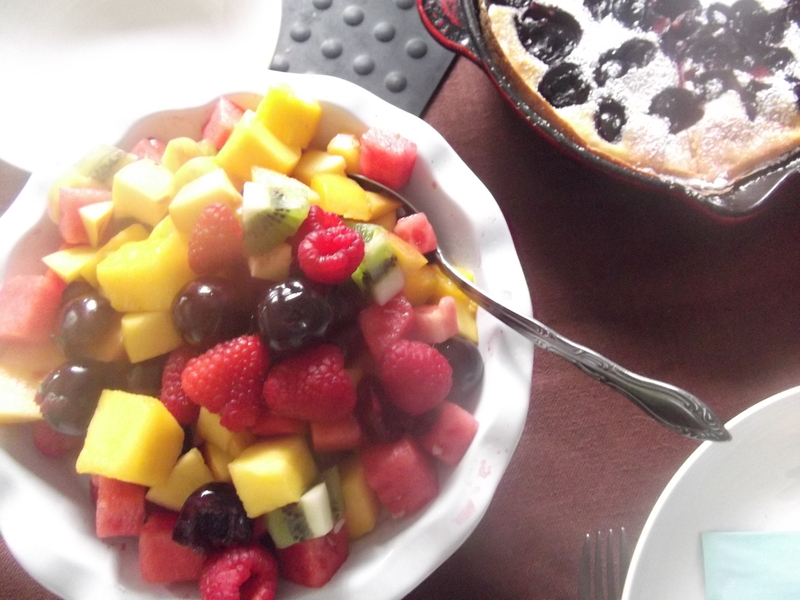 Serve hot, with brunch foods. It’s 4:00 a.m. and I’ve been up since 3:00 with the baby. A grain of salt, yes, and maybe booze and a babysitter would help (not gonna happen tonight). Also, this recipe may make the hubs propose all over again; no small feat given I must look pretty haggard this early in the morning, getting woken up all the time. Oh, and let’s get the babies together soon? I wonder if this would work with side pork? I’ve never worked with pork belly but I do have side pork left over from a pig we butchered a while back. Also, I look like I have no hair in those photos but I am okay with that. And it was goooooooooooooooood!!! As I said (in front of my wife) – sometimes I’d rather be married to you, Emily. 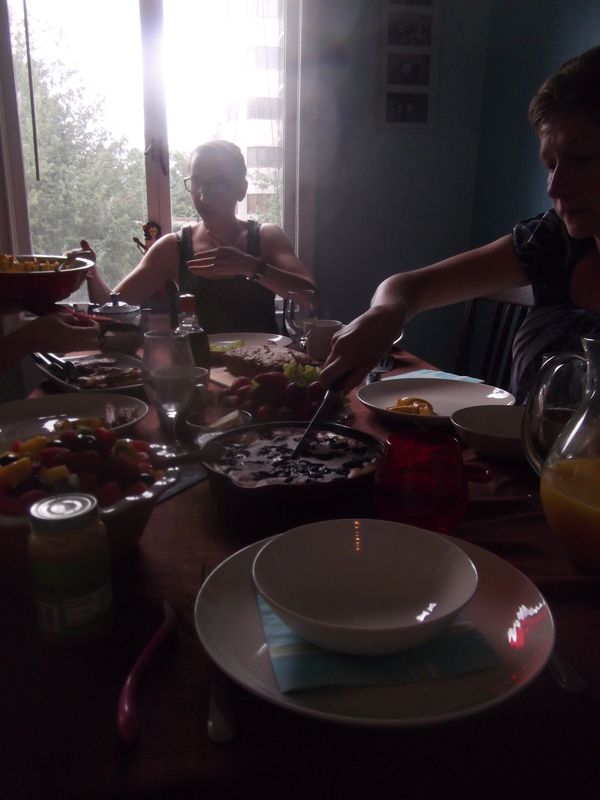 That top photo at the table looks like a dream morning. I can’t say pork belly gets me going, but the candied part is intriguing. And I love how you can take us from turnips to corn waffles to pork belly without batting an eye … your repertoire astounds. Eileen: YES! Babies together soon. Also when they sleep through the night you never have to see 4:00 a.m. again, I assume. A few short months to go! Lisa: Pretty sure you can use a pork side; this cooks low and slow enough that it would be just fine. If you were worried about there not being enough fat, you could add some more cider to the pan for the braise. Also, do you butcher your own pigs?! That sounds amazing and I’m weirdly envious. Ethel: Thank you, you and Le Monsieur are too kind. Aimee: I’d marry you too. Even if it would mean we’d be saddled with two kids under two. Hannah: Thank you! I’m not sure if it’s range or ADHD. But I promise, the pork belly is kind of like very thick bacon, if that sounds appealing? Oh my god that looks heavenly, delicious, and all things magical. There is just nothing bad with pork belly.